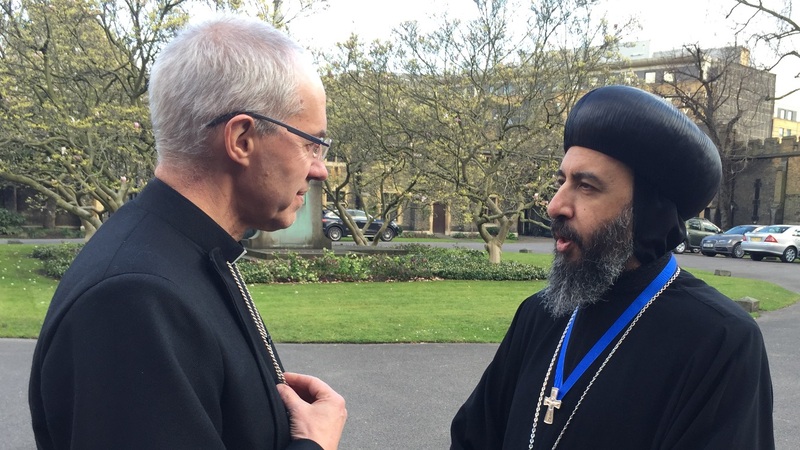 The Lambeth Cross for Ecumenism was conferred upon His Grace Bishop Angaelos, General Bishop of the Coptic Orthodox Church in the United Kingdom, by the Archbishop of Canterbury, the Most Reverend and Right Honourable Justin Welby, on 31 March 2016 at Lambeth Palace. The Lambeth Cross has been the highest honour bestowed by the Archbishop of Canterbury since 1939 and is conferred to distinguished hierarchs who have rendered exceptional services to the cause of Christian unity. Earlier in the week, after having preached at the Easter Sunday Coventry Cathedral service at the invitation of the Bishop of Coventry, His Grace Bishop Christopher Cocksworth, Bishop Angaelos was also awarded the Coventry Cross of Nails in recognition of his work on reconciliation by the Dean of Coventry Cathedral, the Very Reverend John Witcombe. The Coventry Cross of Nails is recognised throughout the world as a symbol of peace and reconciliation. Although it has been awarded to hundreds of charities and organisations over many years, it is only rarely presented to individuals. These two awards were preceded by Bishop Angaelos being conferred the honour of Officer of the Most Excellent Order of the British Empire for ‘Services to International Religious Freedom’ by Her Majesty The Queen in 2015. These three awards represent three core components of His Grace’s ministry: Ecumenism, Reconciliation and Religious Freedom, alongside his pastoral and youth ministry. 0 Comment(s) to the "Bishop Angaelos conferred Lambeth Cross for Ecumenism by Archbishop of Canterbury"